Thanks so much for visiting, Kristen! First, thank you to Charley for having me here on her blog. Second, hello there to everyone reading. I’m Kristen Slater and I’m one of the newest signings with Dreamspinner Press. This post is part of a blog tour to talk about my recently published book Working It Out. A complete list of the blogs on the tour can be found on my blog and I’m also running a giveaway during the tour (details below). Today I wanted to talk about how amazing people can be. You know, we hear so often that the world’s going to hell in a handbasket. That people don’t care any more, that charity and kindness are rare commodities. In my experience that’s bunkum. I see people helping strangers all around me. Whether it be assisting a woman with a stroller, a toddler and a pile of shopping to get on or off a bus. Or stopping to give someone directions for where they’re going. Or even something as simple as telling someone the time. People give of their time to help people they’ll never know. Volunteers help children learn to read, send aid packages to needy people on the other side of the globe, man soup kitchens and charity shops, help elderly or disabled neighbours with household tasks and shopping. I met a few amazing people while putting Working It Out together. There was the artist who created the lovely cover and uncomplainingly made changes that couldn’t have been easy so that it matched my vision. Then the blurb writers who came up with something I couldn’t have written if I’d had a year to do it. And the editors, who helped me see where the gaps were, what needed strengthening, information that was in the wrong place. Finally there were lots of people who gave their time and knowledge to answer some of the questions the editors raised. I’m grateful to them all. In the story one of my guys, Joe, is seriously injured when a car hits him. He spends some time in hospital, at first unconscious, and is then discharged home where his boyfriend, Cas, takes on responsibility for his physical therapy. The editors’ first question was about how long Joe is unconscious. I’d given him a week and the editor thought that was a bit short. I work at a general practice and our doctors have a weekly slot where staff can pop in and ask questions, say hello etc. I toddled along and explained the situation and asked for their opinion. Far from telling me not to bother them with such nonsense, they happily discussed it and advised me. They agreed with the editors, and Joe is now unconscious for two weeks instead, avoiding cries of disbelief at my ignorance. Another editor queried the physical therapy regime I’ve given Joe. He has a broken hip and she said “If he has broken bones that need to heal, I would think he shouldn’t be moving them at all”. Well, I had a panicked moment in which I thought, “oh heck, I think she may be right”. Dreamspinner Press has a discussion group for its authors and I posed the question to the group. Boy was I relieved. The story kind of depends on the therapy being how it is and it was far to late to rewrite from scratch. I got friendly, helpful answers, really quickly. It turns out that, with a joint, doctors will try and get you moving again pronto. I was given people’s personal experiences, professional opinions (there are health workers among the other writers), and even a link to a patient information leaflet from a specialist centre with diagrams of how they fix the hip joint and the type of exercises you have to do. And the editors. Oh wow. They were so thorough. They didn’t just point out holes or inconsistencies. They made good suggestions for improvements, they helped me pick out the best words for things, they had a long and enjoyable discussion with me about gummy bears (seriously). Now, it may well be their job to help weed out the problems with a story, but they didn’t have to go to the lengths that they did. Helping me find words that translated beyond the borders of the UK, even down to what decorations to put on a birthday cake. That’s definitely above and beyond. Now, up above, I mentioned a competition. To celebrate my first ever published story, I’m running a Rafflecopter giveaway for a $10 gift certificate for the Dreamspinner Press store. You can enter by commenting on any of the posts on my blog tour and then visiting Rafflecopter to tell me about it. While there you can click to follow me on twitter and follow my blog for more opportunities to win. If you can’t think of anything to say, I have a question for you. How many amazing people do you know, or see around you? Celebrating six months with his boyfriend has Cas in a bit of a panic. Joe’s been saying “I love you” for a while, but Cas just can’t get the words past his lips. A week before Christmas, he finally says them when a nearly fatal accident almost takes Joe, and Cas faces the possibility of losing the best man he’s ever known. But whispered declarations are one thing. Through a long, tough recovery both men must work out that love is more than words. 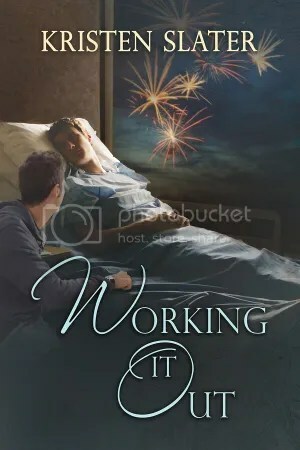 Working It Out is available from Dreamspinner Press. You can find me burbling aimlessly online on my blog at http://kristenslater.wordpress.com and occasionally tweeting as @Slater_Kristen. This entry was posted in For Your Reading Pleasure and tagged Dreamspinner Press, Giveaway, Guest Author, Kristen Slater, MM Romance by Charley Descoteaux. Bookmark the permalink. Excellent post, I enjoyed it! Looking forward to the book. And thanks for the Rafflecopter giveaway, I’ll check it out. I know a lot of amazing people. My boyfriend. My best friend (a fellow DSP author). Some other friends I’ve met online and in person. My parents. Yeah, some people are just regular people, but I seem to keep meeting people who go above and beyond to help others. It’s a wonderful thing. Gosh I do know some amazing people, well I love my family and friends and I love how my brother supports & loves his wife through a terrible illness, I know a women who runs marathon for a cancer charity whilst having that illness herself, I have a friend who sailed around the world also for charity, I know people who do that simple kind thing of helping someone with their shopping or just saying hello when a lonely person needs to hear a kind voice. I tend to be an observer and I try to look for those sort of good things around me, those simple acts of kindness and I also try to do them myself, just to see someone smile and hopefully one day some kindness maybe returned to me when I need it. I was brought up to the saying treat someone how you expect to be treated yourself and be good to those you pass when you are climbing up as you may meet them again when you fall down! Thanks to both of you for commenting! It’s nice to know it isn’t just me who meets and sees great people. And I remember being taught to treat people the way I’d like to be treated as well. I don’t always succeed, but I’m working on improving.